Gmail Labs has two useful experimental features: hierarchical labels and message preview. If you used Greasemonkey, it's likely that you've tried Folders4Gmail and Mihai Parparita's Conversation Preview, two scripts with similar functionality to the new Gmail Labs experiments. Nested Labels is just a cosmetic change that lets you create labels which are displayed hierarchically. If you enable this experiment and create a label like Mailing-Lists/Linux, you'll notice that Linux is displayed as a subfolder of Mailing-Lists. 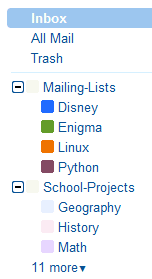 Unfortunately, all the other places that let you interact with labels show the label as Mailing-Lists/Linux. "You can create complex hierarchies of labels if that's the way you like to organize your mail, and you can expand/collapse labels to save space. You'll always be able to tell whether a given label contains unread messages in its collapsed child labels by looking at whether it's bold or not," explains Google. Message Sneak Peek shows a small preview of a conversation, so you can quickly read the first sentences without opening the conversation. Right-click on a conversation from the inbox or from another view and you should see the first unread message from that conversation. If you've read all messages from a conversation, Gmail shows the last message. There's also a keyboard shortcut for showing the preview pane for the currently selected conversation: h. You can navigate to the previous/next conversation using k and j or dismiss the pane using Escape. When I apply a "Sub Label" to an item it should inherit the master label as well. That's not happening in Gmail. Technically, there's no sublabel. When you create a label like L1/L2, Gmail displays it hierarchically as two nested labels, but it's still one label. Note that / is replaced by - for the sake of searching. When you use the search field, Gmail makes this switch automatically. But if you have saved a search criteria for a filter or for multiple inboxes, you need to replace the slash with a hyphen yourself. Hope they see users like it and implement in a better way, and in all products. PicasaWeb lacks this much more than gmail. I don't want a "PREVIEW PANE"! The nested label only work for label that are "shown". Not for those that are hidden. The hidden ones (visible when selecting "Show", are still listed in a linear fashion. 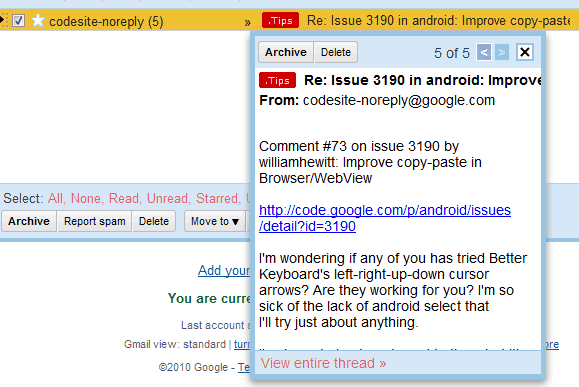 i really hope that this nested-label feature could be available in Google Reader, it'll be much more useful. While we're talking about gmail features, I'd like uncompleted scheduled tasks to keep moving to the current date until they are marked complete. That way, they stay visible. I wish there was an option for a permanent preview pane! if I want to search for all unread messages in any sublabel of mailing-lists, is there a better way to search than "is:unread label:mailing-list/first-list OR label:mailing-list/second-list OR label:mailing-list/third-list" something like "is:unread label:mailing-list/*"
I wish the labels in the message list didn't show the whole hierarchy with all the slashes. It looks messy. Within the message list, only the primary label should appear.